The AAII weekly sentiment survey shows that the consensus reversed suddenly from the giddily bullish extreme that we saw last week. The bulls fell to 37%, a decline of 17% points. And the bears increased to 40% coming to an almost perfect equilibrium. While this is a dramatic decrease in their level of optimism, I’m still cautious. 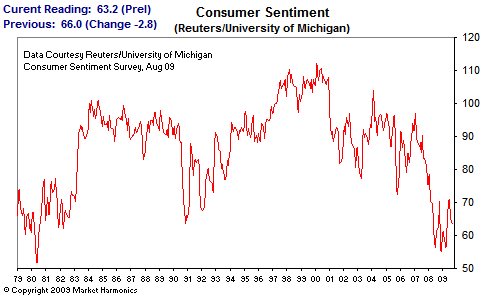 The last time we had the same level of bullishness in the AAII survey was in early May 2008. And as I mentioned during last week’s sentiment overview, the stock market didn’t roll over immediately in response. The S&P 500 actually climbed slightly higher in the following weeks. So just because the market has overtaken last week’s highs does not absolve it from a potentially mortal weakness. The average exposure recommended by stock newsletter editors (as measured by the Hulbert Stock Newsletter Sentiment Index) fell to 30.3% - that’s a sharp decline of 17% points from just 7 days ago. From a contrarian point of view, if the level of bearishness continues to rise even as the stock market rises, then it would imply that this rally still has some life left in it. But we aren’t there yet. This week’s Investors Intelligence survey was little changed from last week: the bulls were at 48.3% and the bears at 23.1%. This is the only sentiment survey that is dancing to its own tune. According to the AAII asset allocation survey equity allocation has reached 57% - a level last seen before the equity markets started their cascade down last year. We touched briefly on the bond allocation at the beginning of the month. At 25% (a 9% point jump!) it is not only the single largest increase but also brings bonds to the highest chunk of the AAII portfolio it has ever been since 1987 when they started keeping track. Finally, to round off, retail investors are finally feeling comfortable enough to leave the safety of cash. After the cash portion of their model portfolio reached a peak of 45% earlier this year, it is now down to just 25%. As I’ve mentioned before, there is a massive pile of cash sitting on the sidelines and it is slowly being deployed. Of course not all of it is ending up in the equity market, but considering the size of the build-up, even a small portion can have a significant effect. The NDR Crowd Sentiment Poll is a proprietary sentiment measure from Ned Davis Research. It surpassed its extreme level (61.5) last week. Since then however it has backed off from this threshold and is now 4.3 points lower to 59.1 - this is similar to the other sentiment surveys covered above. According to a Merrill Lynch survey of 204 fund managers, managing a total of $554 billion, 75% believe that the global economy will improve in the next 12 months. That is the highest level of optimism since November 2003. A smaller amount (70%) expect corporate profits to rise in the coming year. Fund managers are putting money where their mouth. They have reduced their cash levels from an average of 4.7% in July to 3.5% in August - the lowest level since July 2007. They have also increased their allocation to equities sharply from last month. Merrill Lynch’s Risk and Liquidity Indicator, which measures risk appetites is at a 2 year high. This dovetails nicely with what we are seeing from the AAII model portfolio allocation (above). The build up of cash was a sudden, fear induced spike. But the unwinding of it is more orderly as a gradual stream of investors decide that it is safe to venture out once more and take risks again. Perhaps more importantly, the short term moving average has as a result, broken well below the multi-year rising channel that contained the put call ratio (red arrow). The lesser known ISE sentiment index (equity only) reached a high of 202 on Friday. 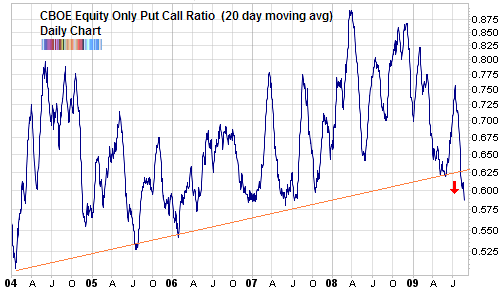 Being a call put ratio, this means that for every 100 puts, there were 202 calls being bought. But the short term moving average of this indicator is still treading water and not at an extreme. Here is the August cover for Futures - a magazine dedicated to news and analysis of options, futures and stock trading. It is not a general interest magazine like Newsweek or even Business Week so I’m not sure how much contrarian weight we can put on it. In any case, the image is of a hazy outline of a bull appearing in the distance. The implied question is, “It might be, it could be, is it?” meaning a bull market. Obviously this is the question that many are grappling with. The interesting aspect of this cover is that it is not boldly trumpeting the arrival of a new bull market but instead timidly asking if it might be, could be true. And finally, wondering if it truly is. 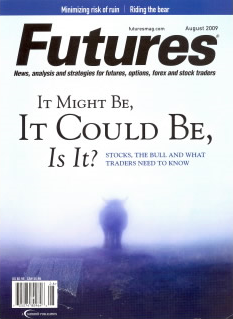 By the way, if you have a US mailing address, for a limited time you can get a free subscription to Futures Magazine. I’m not sure how long this special offer will last so sign up right now. Where does the cash from the sidelines go once the seller takes it in exchange for his/her stock? Technically, isn’t the seller now on the sidelines?